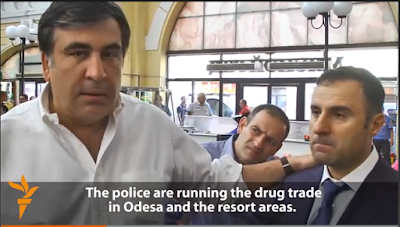 ODESSA, Ukraine -- Less than three weeks into his new job as Odessa governor, Mikheil Saakashvili is rolling up his sleeves. Georgia's flamboyant former president was seen touring the Ukrainian port city on June 16, mingling with locals and doling out promises of sweeping change. The excursion was partly aimed at introducing his new, handpicked regional police chief, Giorgi Lortkipanidze, to the people of Odessa. "This is Odessa's new police chief," Saakashvili told vendors in a store, cheerfully patting Lortkipanidze on the shoulder. "I brought him here so he can get familiar with the problems, see where real people go, not bosses, and make sure everything depends on you rather than run to his bosses." He then took his new protege to the market, where he launched into a passionate tirade about the need to rid Odessa of drugs and corruption. Saakashvili, who oversaw a harsh crackdown on drugs and government corruption in his home country, seems intent on launching a similar campaign in this Ukrainian city, which is notorious as a hub for crime and drugs. "Drug trafficking in the city, in Odessa and in the resort area, is entirely controlled by the police," he told journalists in front of the market's meat section, his hand still on Lortkipanidze's shoulder. "As soon as they say they are fighting against drugs, they are lying." Saakashvili instructed his new police chief to pay heed to ordinary people. "These are your bosses, they will tell you," he said, pointing to the market vendors. Lortkipanidze, a former Georgian deputy interior minister who stepped into his new job on June 15, looked glum and quietly nodded. Saakashvili then ran into a grouchy tram driver complaining about a parked vehicle blocking the road. "Some people think they are above the law," Saakashvili animatedly told passengers after boarding the tram with Lortkipanidze and a crew of journalists in tow. He introduced his new police chief and pledged to "restore order" in Odessa. The pair, however, didn't wait for the offending motorist to return. They ended their tour by driving away in their own vehicle, a black chauffeured Mercedes. Saakashvili, a longtime friend of Ukrainian President Petro Poroshenko, left Georgia after his presidential term ended in 2013 and is now wanted by the new Georgian authorities on charges of abuse of power.